I hope you are all having a great week so far! Can you believe it is mid May already? It has been pretty cool here so far this spring...we have only been in the 50's :( Really wanting some of that warm 90 degree weather that some of you are having, lol! I have a quick little baby card to share with you using an adorable cut file from Pretty Paper Pretty Ribbons called Safari Love that I cut on my Silhouette. Lisa is also having a fun challenge going on and thought I would jump in a play along in the girly challenge since I am in need of a girl baby card :) Yeah! I started with a red card base and then a base layer of white. I followed with a panel cut at 4 1/4 x 4 1/2 which I embossed with the SU Petals of Plenty folder for dimension. The frame is a Spellbinders Floral Oval which I adhered in place and added some fun gems to. I popped this adorable little giraffe to the center with foam tape and added a little doodling. The sentiment in the center of the balloon is My Craft Spot's Bundle of Joy stamp set. The sentiment along the bottom is stamped from the Banner Sentiment stamp set. I finished by adding a few fun sequins and a fun striped bow using ribbon from my stash. This is so sweet! Thank you for sharing it with us at Paper Issues! Too cute, love that giraffe. Love this to every precious bits of it's cuteness! Sherrie you make the cutest cards! This is adorable !!!! What a perfect baby card !!! The giraffe is so cute !!!! This is SO adorable Sherrie! I love that little giraffe! Great colors and AWESOME dimension! OMG I had to look around and see where I was, LOL... Your blog makeover is absolutely amazing Sherrie!!!! I love it so much! 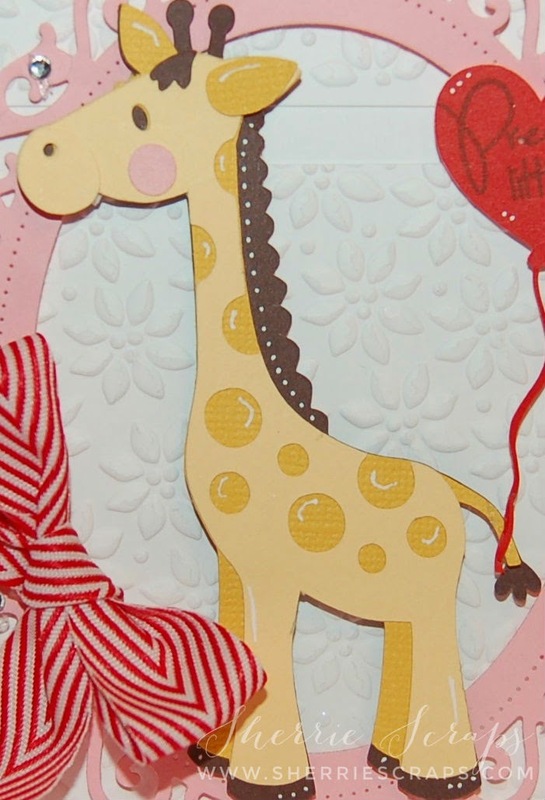 Your card is adorable , love the chevron bow and I don't know if you knew this but Giraffes have become my favorite animal, gorgeous card!!! hugs and thanks for thinking of me, that meant so much to hear that! Sherrie, your card is SO cute!! I love that sweet little giraffe - and your doodling makes it look fabulous! What a super frame too! I'm not sure if it's just me being a bit slow, but I LOVE the look of your blog! Absolutely FANTASTIC! As for email notifications - no, I'm still not getting them. What about you? Please let me know when/if you hear of a solution. I miss you at MCS! Glad all is well, even if it's still a bit cool. As I keep telling everybody, at least it's not snowing anymore!! So sweet! I love this new blog look. This is so super adorable Sherrie!!! LOVE that CUTE giraffe!!! GREAT colors and awesome card LO!! Soooooooooo cute! LOVING that giraffe!!!! How very, very sweet! The embossed background and sweet pink frame just set off that darling giraffe perfectly. Total sweetness! This is so cute and sweet Sherrie! Love the new look of the blog! Let me begin my saying how much I LOVE your new Blog look!!Fabulous!! Your card is Precious!! Whenever I make a card and do not add a ribbon I am sad..LOL. such a sweet card Sherrie, I love the sweet little giraffe!! This is so sweet and adorable, Sherrie!! The giraffe is so cute!! I love how you framed her!! The balloon on the tail - awesome!! And the embossing is fabulous!! What a beautiful card - love it!! Very cute card! I love the little giraffe, so cute! Have a wonderful weekend my friend! Absolutely adorable Sherrie!! Love the new look too!! Super cute, but the doodling on your giraffe is a perfect touch! Sherrie ~ TOTALLY ADORABLE! Oh my! LOVE the giraffe and all the details! They should frame this card ~ its so CUTE! I forgot to say I LVOE the new look of your blog! EEK! So clean and fresh! PERFECTLY done! Super adorable....I really love this colour combo, so pretty , great card Sherrie! What a super sweet card!! Love the adorable giraffe!!! Love your new blog!! Have a great day. Oh Sherrie what a sweet card. I love the embossing and that adorable giraffe. BTW way love your new blog look. SO CUTE!!! LOVE this card, Sherrie!!! The frame is so pretty!!! And I love the embossed mat! Fabulous!!! Sherrie this is so stinkin cute! I love the giraffe and the balloon attached to it!! What a sweet, sweet card!! The giraffe is adorable! I love that bow and the way you placed the embossed pieces!! Adorable card Sherrie. Love the look of your blog. I bet you changed it ages ago but I am so behind in blogland that I am desperately struggling to catch up. Hope all is well with you my friend and enjoy the long weekend.